You choose colors and features. Return your purchase postage-paid for any reason within 30 days of receipt for a full refund. "He's gorgeous! Perfect workmanship! Beautiful packaging!" "My niece loved it. She built it herself." "I am very satisfied with my recent purchase! The monsters were very vibrant and adorable. My 6 year old carries the monster he made with him everywhere. 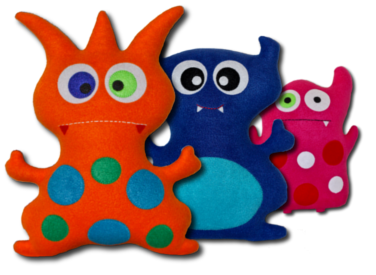 ...the cuties are fun to make, are of high quality, and are made in the USA. Can't beat any of that." "Thanks for rushing out my lil' monster, it's cuter than I imagined! Love it!" "Loved the tooth pillow. Intend to order more for my friends." "A friend told me about the fairy tooth and so I let my daughter make one. She loves it and I wouldn't change a thing. We will recommend it to our friends."